Develop a positive environment of teamwork and cooperation with your youth group, school, or workplace. Our fun yet challenging team building objectives will help your group grow closer to each other while growing closer to their Lord and Savior Jesus Christ. Stretch your group to trust, encourage, and support each other as they attempt our games, challenges, and collaborative initiatives. 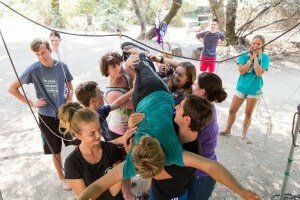 We use our base camp on the South Fork of the American River in Northern California to customize this day to help teams of individuals to become cohesive tightly knit groups. We use fun games, outdoor challenges, icebreakers, and problem solving exercises to help build Christian unity within your group. In addition to our high-energy team building training exercises, we will also take advantage of beautiful outdoor setting, challenging your team members with times of stillness designed for an intimate encounter with God in His creation. Minimum of ten people for one day team building days. We also do corporate team building activities designed to help your workplace become an effective team. We want all of our groups to leave camp as a successful team. We see the outdoors as a critically important tool for today’s Christian leader. At Rock-N-Water we spend every day and night in God’s enticing playground. The adventurous challenges and tranquil beauty God gave us in nature allow for a depth of ministry we know no other way of achieving. Christian led team building outside makes for great opportunity to have fun, help deepen relationships, and make positive spiritual growth in lives. 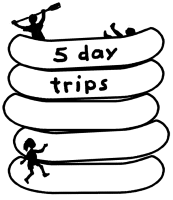 By default, each of the above multi-day team building trips have you arrive around 7 PM the night before (eating dinner before you arrive), and leaving around 6 PM (eating dinner on the road) at the end of your last adventure. If you would like to do the same on a one day trip, it’s just an extra $20/person. One day team building training events and corporate team building activities require a minimum of 10 people. If you live more than 3 hours away, or you just want to finish your day of team building games with even more awesomeness, we recommend you add dinner and another night of camping & campfire time to the end of your team building exercises for just $20/person. There is an extra $15 per person fee for doing adventures on a Saturday or Sunday. Why weekends cost more? For river rafting trips that take place October through June there is an extra $15 per person fee in these months. What's it cover? Again, please contact us if you have any questions about helping your church youth group, school class, or managing team learn to work better together.